All over the internet, people are reporting surprisingly good results using electricity to combat various ailments. Sometimes it is discovered accidentally, sometimes by design, but the results are compelling. Electric Fence cures Ross River Virus? In 1996, it was reported by Nexus Magazine that farmers in Bunbury Australia, were using electricity to heal themselves of Ross River Virus, an Australian mosquito-borne affliction with similar symptoms to Lyme disease. It began with a farmer in Bunbury, Australia who was diagnosed with Ross River virus, as confirmed by blood tests. One day a young bull pinned the farmer against a 7,500 volt electric fence. After his encounter with the fence, his symptoms disappeared. Two weeks later, a workmate, also diagnosed with Ross River virus, decided to purposely try the electric fence treatment. His symptoms also disappeared. (Nexus Magazine, August-September 1996). "Zapping the AIDS virus with low-voltage electric current can nearly eliminate its ability to infect human white blood cells cultured in the laboratory," reports a research team at the Albert Einstein College of Medicine in New York City. Using a darkfield microscope, the late Dr. Alfons Weber of Germany discovered parasites in the blood cells of all his cancer patients. Two healing practitioners in Berlin, Bea Langhammer and Thomas Blasig, have observed that the quickest way to clear the parasites from the blood cells is the use of blood electrification and magnetic pulsing, along with a nutritional program. In Ecuador, high voltage, low current electric shocks have proved very successful as a treatment for snake bites. In the eastern Amazon jungles of Ecuador, 4 percent of deaths are caused by snake bites. The standard treatment is to give anti-venom as soon as possible. However, the necessary serum may not be available in remote areas. The idea of using an electrical current for treating venomous bites arose from a report in a local Illinois paper. A farmer who was hyper-allergic to bee stings found that applying a high voltage, low amperage, direct current shock to the site of his bee stings prevented his usual severe reactions. For snake bites a 20-25 kV, <1 mA direct current is applied to the site of the bite. The bitten area (usually a limb) is electrically grounded as close to the bite as possible and current is applied via an insolated probe to the bite for 1 to 2 seconds. Usually four or five shocks are given, with 5-10 seconds between them. An outboard motor is one commonly available source of such current. A lead carrying an insulated probe can be attached to a spark plug, and the current is best applied with the engine at half-throttle. Other motors with spark plugs (lawnmowers and auxiliary lighting plants - not diesel engines) have also been used with excellent results. We have records on 34 cases of bites in limbs where there was evidence of penetration of the skin. The current was applied within 30 minutes and 10 - 15 minutes later, all pain had gone and the usual sequelae of an untreated bite (swelling, serosanguinous bullae, bleeding, shock and renal failure) did not develop. No patient died. After an hour the patient was usually able to go home. At follow up there was no necrosis of tissue around the bite due either to the bite or the treatment. 7 people who refused the treatment experienced the classic complications and 2 needed the life-saving amputations. Two other patients were not treated until 2 hours after being bitten by viper snakes and they arrived with swollen limbs and intense pain and 1 had signs of spontaneous bleeding. Seven electrical treatments were given producing pain relief in 30 minutes. 12 hours later the swellings had not progressed and there were no signs of bleeding. After 3 days the swelling had almost disappeared, however a small necrotic area (developed) around the bite site. This technique has been used equally successfully by other investigators in the jungles of Ecuador for other types of bites, such as those of the ant (Paraponera sp) and the black scorpion (Tityus sp.). Colleagues in Iran, Java, Indonesia and Peru have also used this technique with similar results. The biological basis of this treatment is unknown. There may be a local effect on the host tissues or there may be a direct effect on the activity of the venom itself. Venom has a short half-life and a shut down of local vessels by electro spasm may confine the venom locally long enough for it to become inactive. Whatever the mechanism, this technique is a practicable and potentially life-saving procedure. Dr. Ronald Guderian, a missionary doctor from Seattle, is given credit for being the first to use high voltage DC to treat snakebites. He has "successfully treated more than 60 cases in the Esmeraldas Province of Ecuador." Dr. Guderian's success has been with using the Stun Gun made by Nova Technologies. Based on Dr. Guderian's experience it seems that if the treatment is received within 15 to 20 minutes after the bite has been inflicted, then the pain stops almost immediately and no swelling will occur. If swelling has already started, then it stops and the pain soon subsides. Dr. Guderian typically uses a Nova Technologies stun gun with one of the electrodes modified so that the current can be passed directly through the limb by placing an electrode on each side. Dr. Guderian began the high voltage DC shock treatment, not on snakebites, but originally on stings and bites from scorpions, ants, bees, wasps, and other kinds of insects. All of the successful treatments have been performed with 20,000 to 25,000 volts or more. It has to be DC voltage, too. Dr. Markus Kryger had read about the electical treatment in a medical journal when he opted to use it on a courthouse employee in southwestern Missouri who was bitten by a copperhead just outside the courthouse. He used jumper cables attached to the spark coil of his car to treat the wound after giving the woman a tetanus shot and disinfecting the bite. "Within the hour, the puzzled patient was back at work." Dr. Kryger became convinced that electrical shock could deactivate snake venom because of the chemistry of the poison. Besides proteins and enzymes, venom contains copper and other trace metals whose electrical properties could be easily upset by high-voltage shock, thereby possibly uncoupling what makes the venom work. Jim Scroggins, vice-president of Nova Technologies, took a trip to Ecuador for the purpose of verifying the incredible claims being made by Dr. Ronald Guderian in regard to the ability of the Nova Stun Gun to treat snakebites. On a hike through the jungle to visit an Indian village, Jim was bitten on the arm by a conga ant. The conga ant's "venom can cause a limb to swell so badly that it can't be used for days." Jim claimed the bite felt like "five wasp stings in the same spot." He shocked the wound with a stun gun and "within 30 to 60 seconds the pain was gone." Even though conga ant bites are supposed to swell the whole limb, Jim had no swelling, only a discolored area the diameter of a baseball. . . . While Jim Scroggins was in Ecuador, a girl was stung on the toe by a scorpion and given the shock treatment with a stun gun. After a few minutes, the pain was gone and the girl left the emergency room. about five minutes. Then, she goes into anaphylactic shock and can't breathe." In the rush to go to the hospital, the Scroggins took time to treat the hand with "two quick half-second zaps" from a Nova Technologies Stun Gun. On the way to the hospital, the pain had stopped, so they turned around and went home. "There was little or no swelling, perhaps one third of what she usually gets from a single bite." Dr. Guderian has found out through various sources that shocks have been used to treat scorpion stings for years in places like India. 40 years ago, people in Nigeria who were stung by scorpions were commonly shocked with the ignition system of a motorcycle. High voltage DC can be used to treat other things as well. While in the city of Esmeraldas, Dr. Guderian had the opportunity to treat a child who had been stung on the back by a stingray. He used a wire connected to an automobile's ignition coil and 20 minutes after the treatment the child was back in the water again playing as if nothing had happened. Dr. Guderian has treated boils with high voltage DC. According to him, if a boil is treated before it comes to a head, the swelling and redness will be gone in three to four days. Dr. Guderian is amazed at how well the shock treatment works to relieve pain. He suspects that the pain deactivation process is separate from the deactivation of the poison. Excerpt from Outdoor Life Magazine, July 1988. 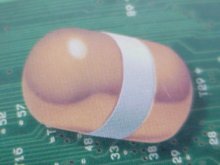 The Russians have developed an electronic pill that, when swallowed, generates low voltage electromagnetic emissions as it descends the length of the gastro-intestinal tract. As it travels, it gives the internal organs a good stimulating jolt and, as an added benefit, electrocutes and expels parasites. The stainless steel capsule, called the Spudnik, was originally developed for abdominal surgery patients to get their intestines working again. In Russia, the Spudnik is also officially used in hospitals for chronic constipation, to improve metabolism, digestion, and peristaltic action. Besides improving gastrointestinal function, Spudnik stimulates organs adjacent to the intestinal tract such as the pancreas, prostate duct systems, gallbladder, liver and kidneys. To use, place the metal capsule in your mouth until you begin to feel the pulse, then swallow the capsule. The Spudnik is turned on by the water and electrolytes in your saliva. The internal battery operates continually in the 2.2 to 4.4 volt range for as long as 110 hours. It is expelled with feces 24 to 36 hours later. Some wash the Spudnik with alcohol and reuse it a couple more times for even better results.